Beersel also has plenty of fun activities to keep the little ones happy – from a fascinating visit to the mystical Castle of Beersel to an afternoon of fun and excitement at the playgrounds of the provincial domain of Huizingen. Entertainment is guaranteed! The Castle of Beersel is the perfect place for a fun and informative family day out. Children will become fully immersed in the world of knights, magicians and squires. Take the family on a trip back in time to unlock the secrets of the mystical Castle of Beersel, one of the best preserved medieval moated castles in Flanders. Enter the castle through the drawbridge. This is where your journey into the world of the medieval fortress and its occupants begins. 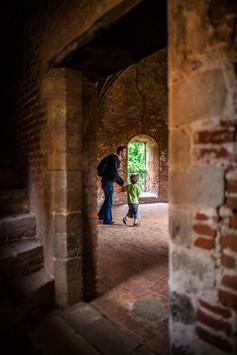 With your instruction sheet and a pencil at hand, you explore the various halls and corridors of the castle. Solve the riddle in the knights hall, peep through the loopholes and stop by the torture chamber. Children are rewarded with a nice souvenir to take home. To find out more about this treasure hunt, go to the pavilion of the castle. Head off on a discovery trail through the Visitor Centre De Lambik with an activity sheet full of fun assignments. An introductory film already offers a glimpse into how lambic beer is brewed. Continue and reach into the touch-and-feel boxes to discover the various ingredients. Put together the pieces of the puzzle to learn more about the traditional art and craft of brewing. A nice surprise awaits you at the end of this discovery tour through the Visitor Centre De Lambik. To schools we also offer the educational tailor-made package The Magic of Lambic beer. More information can be found at next link. At the provincial domain of Huizingen, children will have the time of their lives. The domain ticks all the boxes: you can take a stroll through the animal park, play a friendly game of miniature golf or take a refreshing dip in the open-air swimming pool. For boys and girls who love action and adventure, there also is a great playground with an extensive ropes and climbing course. In short, a visit to the provincial domain is the perfect way to end a wonderful family day out in Beersel. Also worth visiting is the site of the Herisem mill in Alsemberg, where you will discover the old process of manufacturing hand-made paper and get an insight into what daily life was like for the workers at the paper mill. You can attend a two-day workshop at the farm or the mill with your class or join one of the theme-based camps organised during the Easter or summer holidays.